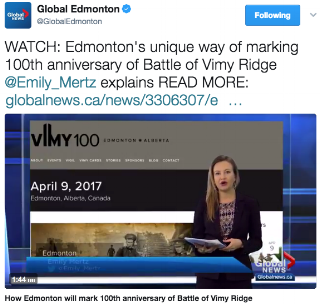 Last year, when I decided to make Plated PR my permanent gig, I joined the Vimy 100 Yeg committee. The centennial of the Battle of Vimy Ridge was coming up fast, and the committee has incredible plans to commemorate the occasion. My role in the committee was to coordinate all of the communications that would be happening around the event. Mainly the social media and the media relations. It wasn't hard to communicate the story behind the event. 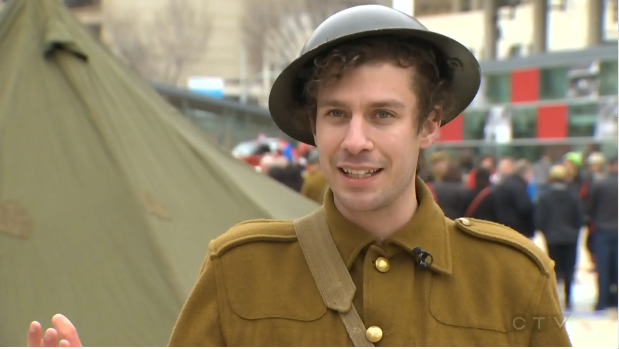 A group of hard-working historians and military officials came together to create a full day's worth of remembrance activities at Churchill Square. I started a Facebook page, Instagram account and Twitter profile. I also wrote key messages and sent out news releases. One of the main events that day was the vigil, where civilians and military officials had the opportunity to start on guard at the Edmonton Cenotaph together in remembrance of the men who fought at Vimy. Global News featured a story on the event, and all pre-registrations for the civilian spots filled overnight. Committee members also appeared on Our Edmonton, Edmonton AM and Alberta Primetime in order to promote the event. On event day, I coordinated all social media and media throughout the day. It was an incredible day, with over 1000 citizens coming out to commemorate the centennial, to witness the parade, participate in the vigil, and to check out the historical interpretation of soldiers in World War uniform. All local media outlets covered the story on the day of. The story made the front page of the Edmonton Journal and Sun, and was featured on Global Edmonton, CTV Edmonton and CBC News. In the end, the event won an IABC Edmonton Capital Award and the organizing committee was recognized at City Hall for their hard work.